The Blue Wave Shuffleboard is our best shuffleboard table, which can be situated at home or in any recreational room or game center. The width at the center is at 24 inches and it also comes with a cleaning brush. You also get a free shuffleboard powder for making it nice and smooth when playing. Our step-up pick is the Playcraft Woodbridge Shuffleboard and it is good for both an entry level and a professional shuffleboard table. With a decent leg cabinet storage for accessories, you have a choice of cherry, honey oak and espresso wood finishes for the table’s cradle and legs. You can also select between 14 feet and 16 feet of length. The budget pick is the MD Sports Shuffleboard and this shuffleboard has PB material at 18 mm and is coated with poly materials and prints for added design. It can be a great addition to your basement, recreational room or home game room. There are also leg levelers for easy adjustment. A shuffleboard table is a kind of table that is used in the rec room game of shuffleboard. It is a game that most people put in their recreational room or sports room alongside ping pong, darts and the like. Shuffleboards are exceptionally long and narrow compared to pool tables and ping pong tables. They are mostly made of wood and have a set number of pucks. Shuffleboard is a game where you try to score by pushing the pucks to the end of the table to the opponent’s side. It is much like bowling and hockey except that the rules are a little bit different. Deck shuffleboard is different from table shuffleboard in the sense that deck shuffleboard is played on the floor while table shuffleboard is much like table tennis or ping pong. The goal of shuffleboard is to score more points than the opponent. 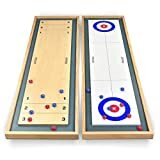 Unlike other board games, shuffleboard requires a tricky estimate and is more like playing pool and bowling combined but using pucks like in hockey. The pucks have different colors and that is what makes them unique compared to bowling. You have to score more points against the opponent by landing on the score zones in the shuffleboard. A shuffleboard will need to be situated in a room that has a longer or wider space so that it will not be too uncomfortable for the players to make their move. Shuffleboard tables are mostly found on recreational rooms of offices but can also be found on some game centers along with darts, pool and table tennis. It is more of a casual than a competitive game and is relatively new for most people. That is why you don’t see shuffleboards that much compared to pool or other table games. Size or length: from 9 to 12 feet, you can get a shuffleboard table that best suits your needs. This is the most common length of a shuffleboard table but some can be as small as 7 feet for smaller rooms or areas. Most shuffleboard tables can be long so make sure you know the size of your area or room before you go on and buy one. Included accessories: game pucks and scorers can be included with the shuffleboard table as a bonus for you to get started in playing. Some already have the complete package which is ideal for those who are not very familiar with the game. Some shuffleboard tables can also include electronic scorers for easy tallying between players. Wood finish: most shuffleboard tables have an authentic wood finish but you have to make sure that the finish is long lasting and will not easily chip off. This ensures that you have a shuffleboard table that can last for the years to come. Indoor or outdoor: do consider where you will want to use the shuffleboard table, whether indoors or outdoors. If you want an outdoor shuffleboard table for family fun then it should have a durable and weatherproof finish that will not easily crack or get stained during extreme weather conditions such as sun, rain or snow. The Blue Wave Shuffleboard is our best shuffleboard table that measures a total of 12 feet across. It has a finish made with dark cherry for a detailed design and weighs about 259 lbs. It is made with a nice hardwood design for durability and comes as a set with all the accessories. The included pucks in this shuffleboard table consists of 4 red pucks and 4 blue pucks. It is easy to adjust and can be a great shuffleboard for beginners. A #7 speed powder would be good for this table. The only con with the Blue Wave Shuffleboard that is not a deal breaker is that it can be a little bit heavy to lift, but this is true for most shuffleboard tables anyway. The Playcraft Woodbridge Shuffleboard is our step-up pick, and comes with all of the necessary playing equipment in the game of shuffleboard. The butcher block has a vertical stave that has been glued to the edge for durability. 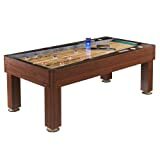 Included in this shuffleboard table are metal leg levelers for uneven surfaces, speed wax or powder, and a total of 8 pucks (4 blue and 4 red) for playing. The MD Sports Shuffleboard is our budget pick, which is made with a durable MDF board at 15 mm in thickness with a play field that has an EVA bumper for durability as well as better action and smooth movement of the pucks. 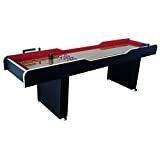 You get all of the pucks and playing accessories with this budget friendly 8-foot long shuffleboard table and it has a sleek cabinet design with a black coating for a clean look. The Fairview 9-ft Shuffleboard has a butcher block play field with a thickness of 1 1/4 inches for better durability and a smooth transition for your pucks. It comes with the shuffleboard wax or powder plus 8 pucks of standard size. The storage cabinet in the pedestal legs can help you store your game accessories. You also get a choice of either mahogany or chestnut finish. The Hathaway Ricochet Shuffleboard has a cherry finish and has four drink holders to have a good game of shuffleboard while having a beer. It has a manual scoring system (abacus) and has 6-inch leg levelers to keep the pucks in line. The butcher block measures 1.5 inches thick with carpeted interior walls. The Playcraft Telluride Pro-Style has an electronic scorer and comes with a butcher block that has a vertical staved glued to the edge of the Canadian maple wood. You have a choice of honey and espresso finishes and the electronic scorer has a Lexan face and measures 24 inches tall. 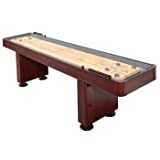 The Playcraft Georgetown Shuffleboardis a good traditional table that has a butcher lock playfield with a thickness of 1 3/4 inches. It has 8 standard pucks, game instructions and the speed wax for the table. A total of 10 polyurethane coats are on the playfield for added gloss and smoothness. The FamilyPoolFun 14-Foot Shuffleboard is given a dark cherry finish and has a total weight of 286 lbs. As a table for larger rooms, it has a durable hardwood surface and comes with 8 standard pucks and speed wax. There is also a table brush for cleaning included with this table. There are 2 abacus scorers on each side of the table for keeping the score in track. The Carmelli Dark Cherry measures a total of 9 feet and is good for small to medium sized game rooms, recreation rooms and man caves. It has a durable set of plywood corners, bronze leg levelers and a total weight of only 250 lbs. It comes with all of the standard playing equipment and has a butcher block playfield with a thickness of 1.5 inches. Shuffleboard wax is also included with this game room table. The GoSports Shuffleboard/Curling Game is our pick for both a curling table and a shuffleboard table which can take up to 4 players at once. It spans 45 inches long and can be a great family reunion hobby or placed in another table. It has a total of 8 pucks and can be flipped on the other side to use as a curling table instead of a shuffleboard table. It is also quite portable in its 2-in-1 design. 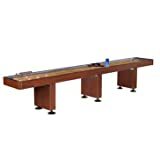 Other shuffleboard tables did not make it to our list because they had lack of durable finish and materials and most of the people who bought them said that they did not last long. It is important to have a sturdy shuffleboard table because it is a playing platform that can serve you years and is quite expensive. Q: What is a shuffleboard and what are the kinds of shuffleboard games and related games? • Floor shuffleboard – usually played on a larger floor area or indoors. • Deck shuffleboard – also played on larger indoor or outdoor areas. • Table shuffleboard – played on top of a long shuffleboard table. Pool, billiards or cue sports – the pool game is one of the closest equivalents of the shuffleboard, which usually involves two players competing against each other in a series of accurate hits. Like billiards, shuffleboard requires the players to score by landing the ball (or the puck in this case) in designated areas (the number or score zones). Most pubs and game centers that have pool may also have shuffleboard. Bowling – another close relative to the shuffleboard game, bowling also involves a long playing area much like shuffleboard. Both of them require good targeting skills and precision to slide the ball (or puck in this case) into a straight line to hit their target score. Both bowling and shuffleboard can be played on the floor, except for the table shuffleboard version. Curling – another similar sport to the shuffleboard is curling, which is like an ice version of bowling that requires you to slide stones to a target. The ground, instead of a wood surface, is a sheet of ice. Air hockey – one of the many similar sports to shuffleboard, they are alike because of the pucks used. Air hockey also uses pucks like shuffleboard, but the mechanism and style of play is different. While air hockey requires players to score the puck to the opponent’s goal, shuffleboard requires players to score in zones and knock the other player’s pucks off. Croquet – the shuffleboard game is quite similar to that croquet because you need to hit wooden balls or plastic balls much like bowling rules. Q: What are the different parts of the shuffleboard? The playing field is the surface where you mainly play the game of shuffleboard. The usual material for the playing field is a combination of polymer and solid maple. Most shuffleboards are mostly wood on their surface and you have to make sure that it is durable enough for rough play or constant games. The playing field can have a weight of 387 to 605 lbs depending on the size or length of the table. The cradle is where the play field rests upon. It is the cabinet that supports the play field and can range from 6 feet to 11 feet in length, depending on how much you can fit into your room or recreational area. If you are going to order a shuffleboard table that needs to be assembled, the cradle is usually split in half for you to put together. The center leg is what supports the middle of the cradle and can be attached with the scoring unit (optional on most brands). The electronics of the shuffleboard, if it has an electronic scoring system, will be located along the center leg. Simply put, the center leg keeps the cradle and table in balance. • Scoring unit – this can be manual or electronic and can be attached in the middle or wherever it is indicated in the user’s manual of the shuffleboard table. • Light kit – this is applicable for electronic scoring shuffleboards so that you can get a flashy game with lighting effects when someone scores in one of the zones. • Pin gate – this is important for those who want to put their shuffleboard table into an arcade or game center because it is needed for coin operated scoring kits. Q: How do I score in shuffleboard? A: The game of shuffleboard makes use of score zones, which are zones in each end of the shuffleboard where your pucks can land on. The objective of the game is to push all of your four weights, four for each player, to reach the shuffleboard’s score zone, adding to your score. Do note, however, that an opponent may have the opportunity to knock down your puck and decrease your score. Q: How do you win a shuffleboard game? A: In shuffleboard , after all of the pucks have been pushed, the score is calculated, and the first one with the highest possible score wins. The highest possible score in shuffleboard is usually 50 points or 100 points, but this can vary depending on the type of shuffleboard that you play with (table, deck or floor shuffleboard). Q: Who can play shuffleboard? Children can play shuffleboard, as long as they can reach the table or have something to stand on. Shuffleboard is a simple game and can enhance a child’s flexibility, timing, balance and hand-eye coordination, much like with playing cue sports and bowling. Shuffleboard is not always for adults – even kids can have fun with their parents in this indoor (and sometimes outdoor) game. While it is not common for kids to play shuffleboard, it’s sure to excite children. Teens can have a good time with shuffleboard much like with pool. Because the concept behind shuffleboard is much like the style of playing billiards or pool, teens and adolescents will find the game of shuffleboard a fun sport that enhances their skills of good timing and accuracy, much like trying to hit the cue ball with the balls on the pool table. It is a game scenario that will be familiar to them. Adults mostly play shuffleboard on bars, pubs and game centers, alongside pool and a good glass of beer. In addition to beer pong, shuffleboard is one of the many games you can find in a “man cave” as well as in office recreational rooms or rec rooms. Shuffleboard is mostly seen as an adult game because you will rarely find it in kids’ arcades due to being quite expensive and hard to find. Seniors can also have fun with shuffleboard much like bowling. Just like adults, most seniors who regularly go to bars and game centers that have pool and darts will most likely have interest with shuffleboard tables as well. Shuffleboard is so casual much like bowling so most seniors will definitely enjoy the shuffleboard much like the youngsters do. Q: What are the different lengths of shuffleboards and what are their uses? As for the clearance, you need to have at least 2 feet of clearance all around it to help with the mobility of the players. In addition, if your shuffleboard has a scoring unit, you may need to have more vertical clearance for it as well. Q: Is shuffleboard an old game or is it still popular? A: Today, shuffleboard is still somewhat popular among teens because it used to be only played in bars and pubs before. Shuffleboard is now a game that can be enjoyed regardless of generation because some clubs today do have shuffleboard platforms in their area, including floor, deck and table shuffleboard. Q: What are the key features of a shuffleboard that one should consider when buying? The design of the shuffleboard table should be made for playing against durability and long wear. It should have a good cabinet design that does not ruin the quality of your game and the cradle and playing field should be perfectly fit for each other. A good shuffleboard starts with design so that it is accident-free and also easy to maintain for the many years to come. The size of the shuffleboard table should be considered as well, because shuffleboard tables are really long. If you intend to buy a shuffleboard table, you must have a ready location for it, at least more than 10 feet across to make sure you get more room for the players to move around. Shuffleboard tables need to be placed in areas that have more space and area to roam around other than for the table itself. The play field of the shuffleboard can also be a deciding factor on the durability and the style of the shuffleboard itself. The usual process of making a shuffleboard play field is by using raw hardwood, dried and goes through a rigorous process of sanding and lacquer finishing. The play field should be highly durable with many layers of quality material so as not to easily wear down after many games. Q: What exactly is shuffleboard powder? A: The shuffleboard powder is a special kind of powder that is sprinkled over the table to make it easy for the pucks to glide over the wooden surface. Think of it as floor wax to make the table smoother. Shuffleboard powder is legal and is used to keep the shuffleboard surface easier to use. Q: What are the speed ratings in shuffleboard powder and how do they affect the shuffleboard? 1 Fastest This is the most slippery of all the speed ratings for shuffleboard powder and is intended for those who want to challenge themselves with shuffleboard and puck handling. 1.5 Really fast This rating is ideal for professional shuffleboard players as well as those who want a shuffleboard that allows for easy control without sacrificing speed and movement. 2 Fast This rating is ideal for tournament play. It is the most common legal rating for those who really want to compete in sanctioned tournaments of shuffleboard. 3 Slightly Fast It’s not as fast as the tournament powder but you can get a good control of the game. It is also known as the Brown Bear and can be a favorite among old time players. 4 Kind of Fast Also known as the Yellow Bear, this is one of the most common powder rating for speed when it comes down to shuffleboard tables. 5 Medium Fast If you keep a table that has a length of 14 to 22 feet then this is the ideal speed rating of powder of choice. It gives off a medium to fast feeling so it’s not too uncomfortable. 6 Medium Speed For tables with lengths of 9 to 12 feet (smaller shuffleboard tables), this is the ideal speed rating to get so as not to unintentionally make the pucks fly out of the table. 7 Slowest Speed Acts as a “slow powder” if you think your table is too slippery for most powders, even on the lowest 6 speed rating. Q: How does playing shuffleboard benefit my health and well-being? Your stress levels will be decreased because it is a casual game. Most games like bowling don’t involve a lot of stressful thinking (unless you really want to make it an official sport) and can be a way for those with desk jobs to get off from work and stress for a while. Because it helps you to focus more on a goal, you can let go of the worries plaguing you and lessen your stress in the long run. Shuffleboard can help build more friendships along the way. A friendly game of shuffleboard at the office can also be a great team building activity. In addition to that, shuffleboard can help you spend more bonding time with family and friends. As a physical game, shuffleboard is also a good way to help get some physical activity to keep you fit and strong. Shuffleboard is both an exercise for your mind and body. While it is not a high intensity workout or sport, shuffleboard can work up some muscles as well and it can even be played during the winter while indoors. Q: Where will I most likely find a shuffleboard? You can find a shuffleboard in your local school, college or university. Some schools do have shuffleboards, although this can be rare depending on the popularity of shuffleboard in your country or area. Most students can also compete in official tournaments of shuffleboard to challenge themselves. Shuffleboard can also be a great way to help students learn math and computing skills because of the scoring system that makes us think ahead, much like with darts. Bars and pubs are one of the most common places you can find a shuffleboard table on. You will most likely find the table version of the shuffleboard on this type of public place. The shuffleboard is mostly stereotyped as a game for adults where it can really be played by any age and not just the older people. Nonetheless, you will most likely find a shuffleboard table alongside a game of “beer pong” as well as darts. If your municipal park has a game center alongside darts, pool and table tennis, you will also most likely find a shuffleboard table there. Shuffleboard is a game for all ages so it is most likely to be there other than all the other casual games. It can either be an indoor or outdoor park. In this case, indoor parks will have the table shuffleboard while the outdoor parks will have the deck or floor shuffleboard. A retirement community or home can also have an amusement area that can have a shuffleboard game, whether it is deck shuffleboard, table shuffleboard or floor shuffleboard. Having a game center for a retirement community or for the seniors and elderly is important so that they can have an active mind and body despite being in their later years to keep them physically and mentally fit. You can also find a shuffleboard in summer camp, but this is most likely the deck or floor shuffleboard type and not the table shuffleboard type – unless the shuffleboard is meant for outdoor use and is made with durable or weather resistant material. Summer camps can be more fun if you add really fun games such as shuffleboard because it can help exercise the whole family in terms of thinking skills accuracy, competitiveness and some physical outdoor fun. Game centers and arcades are also a place you can find a shuffleboard table on. It depends on the game center’s size if they will have a floor or deck shuffleboard or a table shuffleboard. Most often, you can find a table shuffleboard if the center has a smaller area and may even have some lights and sounds and electronic scoring for ease of monitoring. It will most likely be next to a ping pong or air hockey table. Man caves or recreational rooms, either for home or office use, can be places where you will most likely find a shuffleboard table. It is a good game to put into this kind of room alongside table games and casual games like darts, board games, air hockey, table tennis, foosball and the like. Most man caves or rec rooms will also feature a mini bar so you can have a nice game of shuffleboard while having a beer. Q: What are the many health benefits of shuffleboard for senior players? Shuffleboard is great for your muscle strength. A game of shuffleboard for the seniors can help them maintain strength even past their 60s so that they can live longer and enjoy life even during their later years. It also keeps them away from sickness and other illnesses that are caused by not exercising enough or being physically fit. You can be more mentally fit and have a sharper memory with shuffleboard. Because shuffleboard requires hand and eye coordination as well as some basic math skills, your grandma or grandpa can benefit from shuffleboard because it can exercise their brain in a good way, added to the physical benefits of playing the actual game, whether on the table or on the floor. A healthy heart is one of the key benefits of playing shuffleboard for the oldies. Shuffleboard is a good exercise and a sport for the seniors because it is a low impact sport. It does not stress your joints and it keeps your heart at a good pace. Having no exercise on your heart puts you at risk to heart diseases and this is why the elderly should have a good heart pace with regular exercise such as shuffleboard. You can evidently release stress to get good vibes out of playing shuffleboard. The game of shuffleboard is not very stressful because it is a simple game that is very casual much like bowling or air hockey. It requires a simple manner of pushing the pucks to score and this can be done by most seniors so they don’t have a lot of pressure and they get more fun out of the game as well. Flexibility is also one of the things seniors can improve with playing shuffleboard. The game can help you be more flexible and this is especially helpful for the seniors so that they don’t end up having too much achy joints and body paints. Having well exercised body parts in your old age is important so that you do not develop bone and joint diseases in the future. Family bonding time is one of the other benefits of playing shuffleboard. Because the game itself can be played by any age, you can join your grandma or grandpa for an old game of shuffleboard, whether it’s the table version, the deck or the floor one. You can also get the grandkids involved for a happy family reunion or friendly competition amongst family members. Q: Can shuffleboard be played indoors and outdoors? A: Yes, shuffleboard is an all-season game, which means that you can play it whether you are indoors or outdoors. However, there are some exceptions, because not all shuffleboard platforms are ideal for indoor or for outdoor use. For instance, deck and floor shuffleboards can either be indoors or outdoors while table shuffleboards are mostly played indoors because they are made of wood on the top and might not always be the right thing to have during the rainy days. Q: Can employees and office workers benefit from a shuffleboard in their recreational room? It helps take away the boredom in the office. If you work on a firm that has either super tight deadlines, serious bosses and other really negative vibes, you can add a little spice and nice things to the office by adding a rec room and especially a shuffleboard table. In addition to that, those offices or firms with almost nothing to do can get more productive and exciting with the shuffleboard table. You can spend more time in the rec room with a shuffleboard table as a form of relaxation. It is a less boring way of taking a break aside from reading magazines or playing with your tablet and gadgets for games, watching Netflix or reading e-books. Adding a touch of indoor sport to your rec room in your office can help make employees happier and less bored when taking a break. It can be a form of team building for the employees. You don’t really have to waste your company funds just to go out on a team building somewhere in the Bahamas – your office space will do. If you do have the right office space then you can definitely set up a recreational room in which you can situate games like the shuffleboard to add to your team building agenda for getting your employees well-acquainted with each other. Believe it or not, productivity will increase thanks to a rec room for your employees. Rec rooms are not supposed to distract the employees – it can help them enhance their critical thinking, problem solving skills and can relate the sport or game to their job in finding solutions and thinking outside of the box. If you find that your employees are having a mental block with their job, a good game of shuffleboard can help them clear their thinking. Q: As a beginner, what tips can you suggest in order to score better in shuffleboard? • If you feel like you are going to lose and you need to score a high 10 or a high 8 to win the game, you can just forget about thinking about the high because it can be hard to do with just one shot and your nervousness getting in the way. • You also need to be careful when placing the block so that you can have the hide of your own that will cover the block instead of your opponent getting the hide. • You can shoot a 10 when the opponent has a score of 55 and above and it is not recommended to shoot a 10 if the score of the opponent is around 49 to 51 because it can be hard to do so. • You should also make it a habit to cover the kitchen because this can be one of the most decisive things in the game that most players will likely forget. Q: What kind of warranty policy will I usually get when I buy a shuffleboard table? The warranty is usually 1 to 2 years depending on the size of your shuffleboard table. Q: How does a shuffleboard table compare to a pool table? Q: What are some of the things that are not allowed during a shuffleboard game? • Players should not touch the puck when it is currently in play. • The table should not be knocked over, even when in accident, so players should be careful around tables to avoid shifting the pucks. • Players should not touch the pucks that end up in the gutter until after the game finishes. • You should also not hold a puck while the other player is shooting to avoid knocking over the other pucks. Q: How is indoor and outdoor shuffleboard different from each other? • Indoor shuffleboard is played on a table and can be played on any time of the year. • Outdoor shuffleboard is played on the floor and uses a shuffleboard stick to play. As a whole, we think that the Blue Wave Shuffleboard is our best shuffleboard table, which has a sufficient length of 12 feet, comes with pucks and speed wax/powder and has a beautiful design and finish.